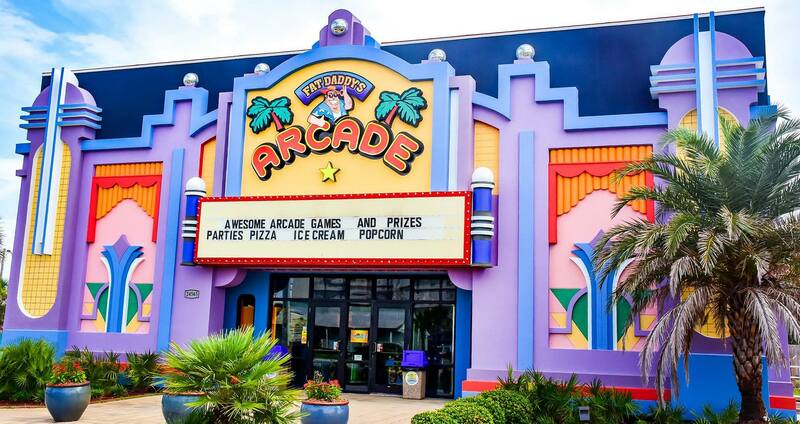 Fat Daddy's Arcade in Orange Beach, Alabama is one of the area's top attractions for family friendly entertainment, featuring over 80 of the latest and greatest arcade games, in addition to traditional arcade favorites. Enjoy interactive arcade games like The Walking Dead, Jurassic Park, Fruit Ninja, Terminator Salvation and Fast Track, to name a few. Guests can also test their skills and press their luck with coin pusher games, prize claws, Monster Drop Extreme, The Wizard of Oz, Stacker, Spongebob pusher, Deal or No Deal, and many more. Traditional arcade enthusiasts also enjoy Ice Ball, Hoops, the big wheel and more. Fat Daddy's Arcade features something fun for all ages and skill levels. After playing all the games, be sure to redeem your points at the arcade redemption counter for great prizes like candy, bracelets, Nerf toys, large stuffed animals, Yeti coolers, electronics and more! to receive $5 off when you spend $25+!